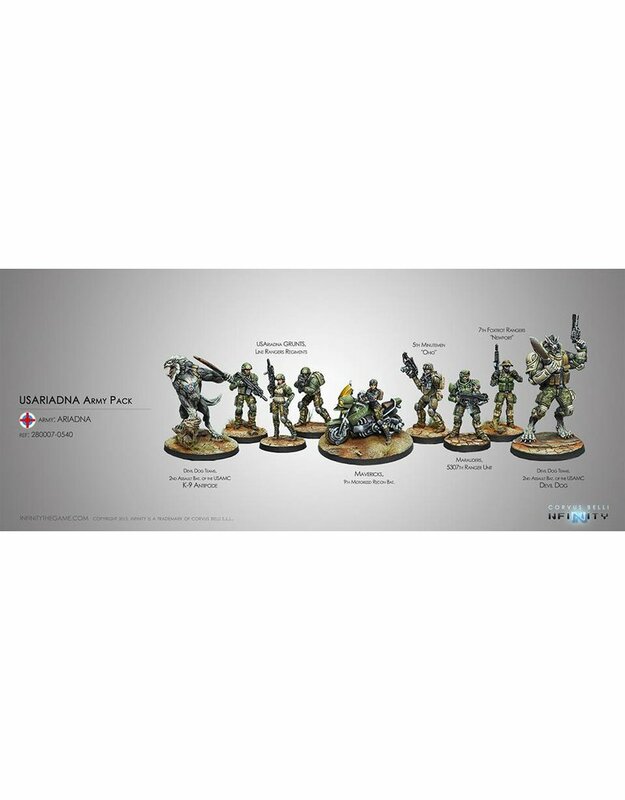 A box containing 8 miniatures belonging to an Ariadnan Sectorial Army, an introductory ruleset, scenery, dice& everything you need to start collecting Infinity or just to complete your collection! Apart of that, the USAriadna Army Pack is the way to be introduced in the Infinity 3rd Edition, the largely awaited revision of this game, as it includes a full color 68 page rulebook (English/Spanish) containing the Quick Start Rules to learn to play Infinity, making easy to understand the game core mechanics. It also includes 1 exclusive miniature, a Maverick with a Boarding Shotgun, a female biker only available in this Army Pack. A total amount of 9 highly detailed metal miniatures! And to fulfill the game experience, the Battle Pack includes ready-to-play cardboard scenery (4 buildings and 6 containers), a game mat, 3 Ariadnan twenty-sided dice, and also cardboard Markers, Templates and a measurement ruler. Everything you need to start playing!